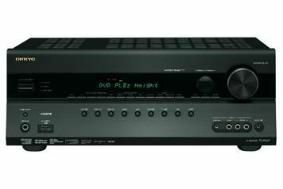 New Onkyo receiver range announced | What Hi-Fi? The aim is to create a bigger, more spacious and room-filling soundfield, and for Onkyo it also provides the consumer with more options when deciding how to configure a 7- or even 9-channel system. Last but certainly not least is the £500 TX-SR607 (pictured). This features 7.2-channel amplification, has a total of six HDMI inputs – including a handy one on the front fascia for a device such as a laptop, games console or HD camcorder – and video upconversion capability. All four receivers also feature four new game surround modes, to enhance the audio experience of particular genres of games. They are: 'RPG' (Role Player Game), 'Action', 'Music' (for Guitar Hero, Rock Band etc) and 'Sports'. All four receivers will become available in the UK in the next few weeks, and some high-end receivers from Onkyo will be announced in May. For more about Onkyo's new hi-fi range, check out our blog.